It's been a month since I made my bullet journal, and it's been quite an experience so far. I started it in hopes that I would be able to organize my life even more than I already was and work my crafting skills to turn this into the journal of my dreams. I've gotten the hang of it in a month, but there are definitely some changes that I want to make for the future. I think I've gotten the basic layout of the weekly posts down. I like keeping track of my daily vitamin and water intake. It's a great way to make sure I've had my vitamins and to chart how much I've been hydrating during the day. I keep a short calendar of the week to schedule my blog posts and any other events, which helps a lot and lets me see what I have going on in the week. There's a section dedicated to weekly wins because it's always good to stay positive and have nice things to look back on! Lastly, I have a musings section where I jot down any ideas that I might have throughout the week. I like the sections that I have so far, but I'm definitely thinking about changing up how it's laid out on the pages. Let me know of any ideas you guys might have, too! I also added a section toward the back of the journal to coordinate blog posts. There are six categories on TWC so far: beauty, college, decor, health, life, and style. Being able to visualize what kinds of content I've been posting lately has helped me a lot in planning out what posts I want to add to the blog in the future. I'm able to see what I'm spending most of my time time blogging about and where I'm lacking in content. 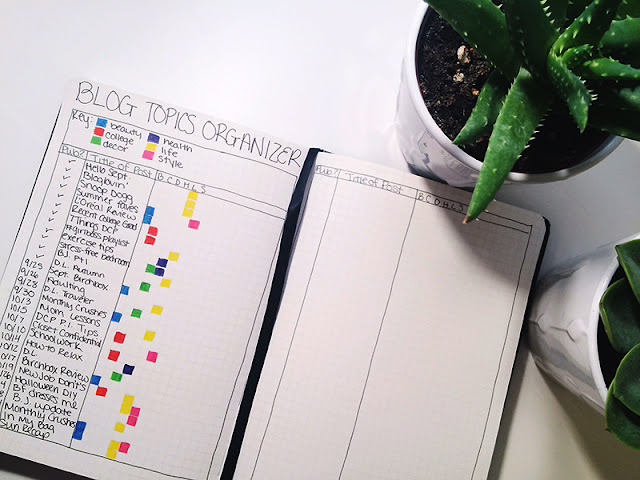 I highly suggest you do something like this to keep organized if you haven't already. I've had some fun working on my bullet journal, but I feel like it's been more of a chore lately than something that can be relaxing. Since I'm working a lot, I come home and I feel like I need to add to the journal before bed. Sometimes I'll write stuff on my to-do lists for the following day that I just don't have time for when I get home from work. It's a little frustrating at times, but it's just something I'll have to work on. I don't have as much free time as I've had before, so I'm not able to do as much as I'd like to. Overall, I think my bullet journal has been a great help to me! It's a good activity to add to your life if you're all about organization and planning, and crafting, of course. 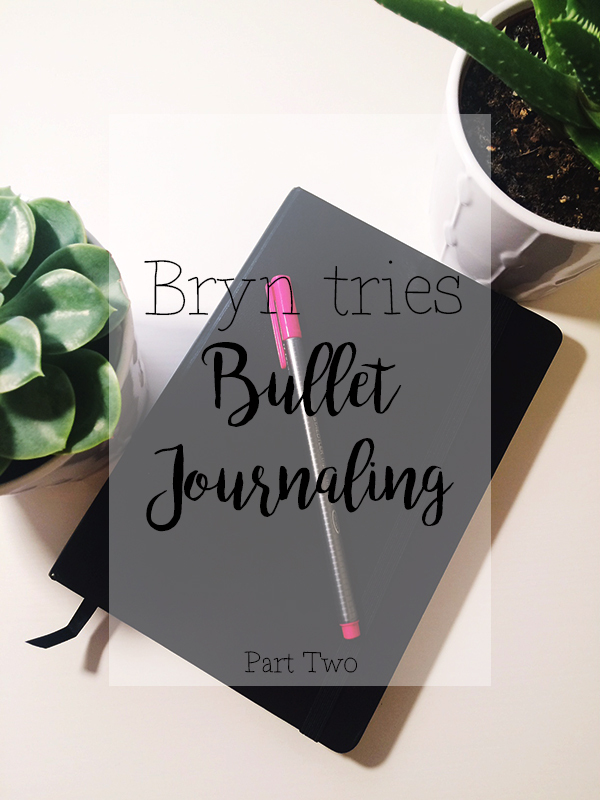 Be on the lookout for another bullet journal update in the next month or so, and follow me on my journey with this new habit! 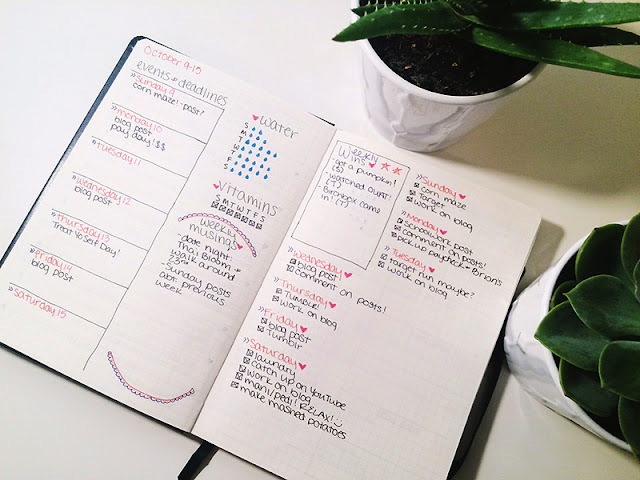 Have you guys started a bullet journal? Have you had one for a while? What are the pros and cons of having one? Quote of the day: "Be inspired, but don't copy,"